One of the twentieth century’s most profound Abstract Expressionists, American artist Sam Francis (1923-1994) is noted as one of the first post-World War II painters to develop an international reputation. Francis created thousands of paintings as well as works on paper, prints and monotypes, housed in major museum collections and institutions around the world. 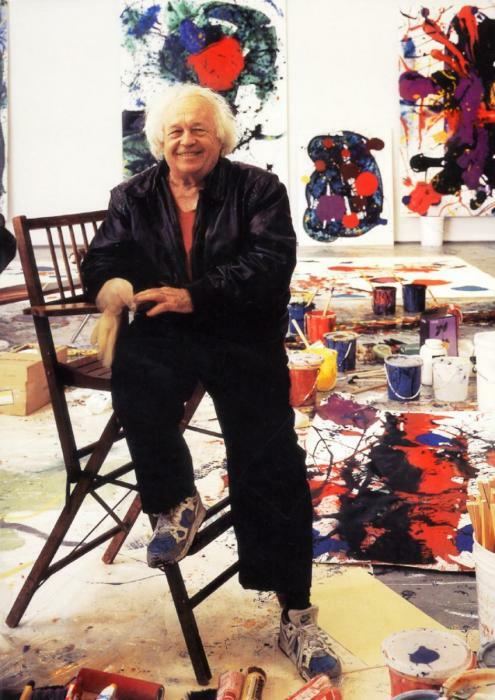 Regarded as one of the leading interpreters of color and light, his work holds references to New York abstract expressionism, color field painting, Chinese and Japanese art, French impressionism and his own Bay Area roots. After graduating from Cal Berkeley in 1950 with a degree in art, Francis moved to Paris, where he would go on to be named by Time Magazine as, “the hottest American painter in Paris these days.” A transformative period of his career, Francis immersed himself in a study of Monet’s Water Lilies and was influenced by his close friendships with the Matisse family and artists Al Held, Joan Mitchell, and Jean-Paul Riopelle. Sam Francis develops his very personal form of spontaneous and gestic drippings. He applies acrylic, oil and watercolors to the image carrier with revolving and splashing motions. Although Sam Francis is often characterized as a second-generation Abstract Expressionist, he defies easy classification. Francis reinvented the physical act of painting for himself, making the most of drips, splatters, and controlled surface accidents. He used a wide range of paint media on both canvas and paper, from oil and watercolor to a variety of acrylics: solvent-based Magna, commercial emulsions, and custom-mixed dispersion paints. Francis began to use acrylic paint regularly in the 1960s, at times combining oil paint with acrylic and other water-based media in the same painting. In doing this, Francis was aware of the different drying times of oil paint versus acrylic. He did not follow a systematic system of experimentation but rather simply allowed oil and acrylic to coexist on the surface - sometimes side by side, sometimes overlapping. (Only a methodical study of multiple works from each period could confirm how many may have acrylic over oil.) Francis did not abide by any formal rules, and at times he freely borrowed from technical innovations in his graphic experiments. Francis was always experimenting with color, whether in painting or printmaking. For his prints he chose each color carefully. The same can be said of his painting, where he often tried out new color sequences and tirelessly created new variations on a particular theme. Not only are Francis’s paintings valued historically for their aesthetic vision, but his inquisitive mind and spirit have solidified Francis’s legacy as a contemporary renaissance man. His interest in the creative process was expansive and synergistic – art, technology, psychology, science, medicine, and protecting the environment (before it became a movement). He was an early investor in research to find creative solutions to our dependence on non-renewable energy sources and cures for aids. In each of these realms, he explored the nature of creativity – what stimulates it, the importance of testing new ideas through experimentation as well as the roles of imagination, intuition and knowledge. Much like Francis believed his life was a series of ongoing challenges, his freedom to explore – his mantra to dream – his life force to be creative.